1) On January 10th - This was the Search + Your World update. This is where Google took the level of Personalisation to a whole new level. This was when Google + and all the social profiles associated with it began to show in the SERPS. Having privacy always at the top of their agenda, Google included the Toogle button too to switch on or off personalization. 2) January 18th - This was the update for Panda 3.2. It was one of the biggest update of 2012. One never understood what exactly this new Panda update was as Google never clarified these changes. 3) January 19th - This was an update for the ads above the fold. This was typically the devaluation of sites that had too many ads on them. Many SEO experts used the term Top heavy for this. Many also saw this as an extension of the January 18th Update for Panda. 4) February 27th - This was the Venice update, this update suggested that Google was looking to strengthen the localization of the organic search results. They wanted to include the local data in the SERPS and give more visibility to it. We do not know or understand if Venice update actually took affect or not. 5) February 27th - This was the Panda 3.3, the second Panda update of 2012. This update did not see any noticeable change or impact on the search engine results. 6) March 12th - This update hovered around the Search Quality Video. This was not an algorithmic update but more into Google checking the quality and processes within Google's search technology. 7) March 23rd - Here Panda 3.4 rolled off. This was the update that affected around 1.6% of search engine results. 8) April 16th - This update was for the problems seen in the parked domain bug. Google confirmed that an error in their data made some sites to be taken for as being parked domains which effectively brought their rankings down. 9) April 19th - Panda 3.5 was the update in April, there were not noticeable changes at all. It did seem Google was readily making changes on its Panda updates quite frequently. 10) April 24th - Every SEO company and webmasters worldwide were worried about this update as it was thought it will bring about big changes on the algorithm. This update was about Google penalizing sites that over-optimize and spam. This update caused alot of misery on around 3.1% searches in English. 11) April 27th - After just a week from the Panda 3.5, the new Panda 3.6 was released with just little impact whatsoever. 12) May 16th - This update was a move towards the semantic search. It was later known as the knowledge graph update.Here google added certain extras to the SERPS such as people, places and things. 13) May 15th - On this day the Penguin 1.1 update was rolled, after which many websites were greatly affected in their rankings. 14) June 8th- This saw the launch of Panda 3.7 which affected even more websites. This was the Panda update that actually hurt users the most. 15) June 19th - This update was in relation to the link warnings by Google. 16) June 25th - The Panda 3.8 was released and this time it affected fewer search queries then the previous update. This was a data only update compared to the others. 17) July 24th - Here came the update for the Panda 3.9. This certainly caused the rankings to fluctuate and affected atleast 1% of all search queries. 18) August 10th - This update was to punish the repeat offenders by Google. It was deemed as the DMCA Penalty update. 19) August 14th - On this day there was a quite a bit of shift in the search engine results places. From the usual top 10, Google only showed 7 places. This update hurt many webmasters as its affects were seen by as much as 18% of search queries. 20) August 20th - This saw the launch of the Panda 3.9.1. This update affected just a smaller number of search queries. 21) September 18th - Panda 3.9.2 rolled out in September 2012. This was a data only update however it did cause the rankings to fluctuate a bit. 22) September 27th - This was a Major update in Google (algorithm and data) as it affected 2.4% search queries. This was the 20th Panda update in the industry. 23) September 27th - This update was in regards to the Exact Match Domain. This has a negative impact as it devalued a large scale of domains that fell under this category. It nearly affected 1% of search queries. 24) October 5th - On this date, the Penguin 3 was rolled out. This was more of a minor update while users were expecting a bigger one. This was more of a reworked update from the previous one. 25) November 5th - Google rolled out their 21st update. 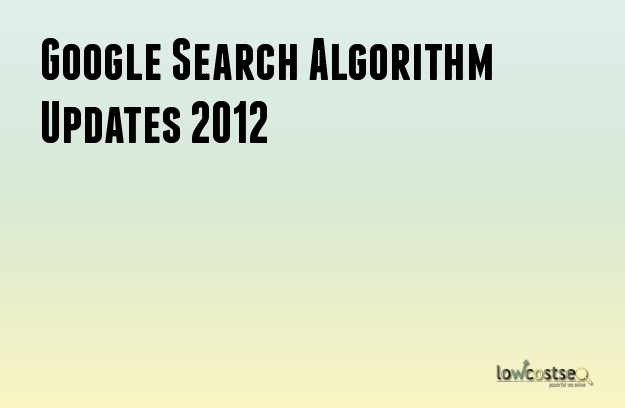 This update was relatively smaller as compared to the other updates and hence impacting a smaller 1.1% search queries. 26) November 21st - Google confirmed this to be their 22nd Panda update which was only data driven. 27) December 21st - This was the last major update of 2012. Google named it as Panda 23. This affected 1.3% of search queries especially English ones. We have all heard of Google's Panda Update but not sure what exactly it is and what does it aim to accomplish this time around. Before we begin checking in the concept or its goals behind the Panda update, it’s vital to track back and understand the evolution of the Search Engine Optimization and why Panda is needed. SEO is the enhancement of a website in order to increase and improve its visibility on search engines such as Google or Bing. In the last decade many unethical SEO firms sprung up in abundance and introduced methods in tricking the normal way of marketing a site. This false trick of the algorithm later on became known as Black hat SEO. Google ever since has taken aggressively strong measures to correct the loopholes and also penalize sites using Black hat SEO. Google wants the quality sites with strong, original and relevant content to rightfully take to the top of the rankings. Poor websites in this regard would plummet in rankings while the good ones would benefit greatly. Google decided to commit in finding a solution to tacking this problem hence the Panda updates were born. The main objective was to catch out the poor low quality sites with duplicated or thin content and penalize the site by sending it to the last page of results. In 2001, this was the year when an important initiative was released in the name of Farmer Update. Hereby Google decided to aim in hitting the content farm websites that have no distinct value whatsoever except for an exceptional amount of text and links. Since this release Google has made further 5 updates to its algorithm and with update the Black hat optimization practice is hit all the time and Google Is slowly but surely winning the game so that the properly well deserved optimized sites are at the top of the ranks. Again, a slight adjustment effecting 1% of queries/sites and includes the freshness update and makes way for the ten updates to the algorithm changes that include Cross-Language retrieval updates, snippets, official page detection and more. See this great infographic from Falling Media that provides a breakdown on how Google changed it algorith in 2011. From penalising the biggies such as Overstock at the turn of the year till the end of the year.